Designed with the latest Hyperseam technology, this Mitre Max Hyperseam D12 Panel Football in White and Black excels in all conditions. 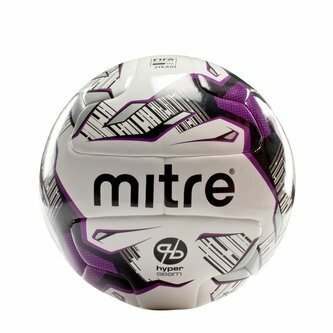 This mitre football has a 12 panel construction for unrivalled aerodynamic control. The high abrasion, eco-friendly PU makes it great for grass and artificial pitches. FIFA Quality Inspected for all round great performance, this means it has passed tests regarding weight, circumference, roundness, bounce, water absorption and loss of pressure, so you can be assured of quality each time you take to the pitch. Whether you're playing on natural or artificial grass, be assured of a pro performance from the ball with this Mitre Hyperseam D12 Panel Football.